There have been several recent books arguing that Christianity is not just about believing the right things; instead, Christianity is a total commitment to following Jesus in all of life, and following Jesus together with his other followers. This genre has become popular, I think, because it is scratching an itch that many Christians have. The bar for being a Christian, at least in recent years in the US and Canada, has been set rather lower than it is set in the Bible. This low bar is defined as follows: believe Jesus died for your sins and you will go to heaven when you die. That’s it. Whatever small amount of guidance there is in this truncated gospel for how to live life now is limited to individualistic platitudes about being a nice person. So there have been books that argue for an expansion of the definition of “gospel,” like Scot McKnight’s The King Jesus Gospel, and there have been books that argue for a more radical lifestyle on the part of Christians, like David Platt’s Radical (I’ve read both and recommend them both). 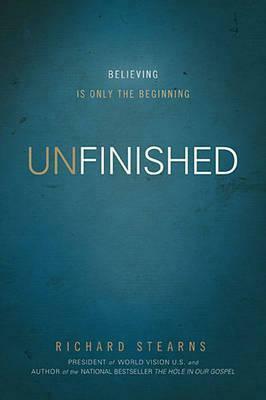 I believe there is a direct connection between the unfinished work of God’s kingdom and our sense of feeling incomplete in our Christian faith because there is a connection between our story and God’s story. If we are not personally engaged in God’s great mission in the world, then we have missed the very thing he created us to do. Stearns begins the book by talking broadly about the meaning of life, about God’s story, and the reason why Jesus left. This is all important stuff, and I understand his desire to begin by grabbing the attention of the largest possible audience, but I thought his discussion was so broad that it was not likely to convince the unconvinced. He really hits his stride in chapter 4, “Magic Kingdom, Tragic Kingdom, and the Kingdom of God.” From here on, he argues that God has put us on this earth to advance his kingdom, and we will never really be satisfied with our lives unless we commit to following wherever he leads and obeying whatever he commands. I agree wholeheartedly with Stearns’s argument, and recommend this book. I found myself encouraged at some points and challenged at others. I can also think of several people I know who would benefit from reading it. But the big question is, “Is this book enough to convince the unconvinced?” In other words, is the argument that Stearns lays out in this book enough to convince people that they have believed an incomplete gospel and cause more people to enlist as foot soldiers for the kingdom? I read James K. A. Smith’s Imagining the Kingdom a few months ago, and I am still haunted by his argument that we are shaped more by our liturgies than by our principles. In other words, assenting to rational arguments doesn’t shape people so much as their habits. In light of that, I was glad to see at the end of this book that Stearns included a “What Are You Going to Do about It?” section. Only time will tell, but this book has the potential to get more people off their butts and enlisted in God’s kingdom. I think it will speak particularly to those who already feel their lives are incomplete in some way.